In a tight game, worthy of a District Final, it was the Falcon’s full-court press that ultimately made the biggest difference. Scoreless at halftime, Glendale finally penetrated the Yellowjackets defense in the 48th minute when sophomore Lindsey Sprouse was able to beat a defender and break down the left hand side into the corner. Turning a second defender, she drove a low hard cross into the six yard box where freshman Emily Cline was charging. The ball caromed off a Lebanon defender and into the net as she attempted to deal with both challenges. The result seemingly was sealed in the 70th when Sprouse scored on a cracker jack header, the ball drawn to her as if on a string, after junior Jeni Frewin did all of the hard work. Frewin has distinguished herself this season as a forward both comfortable and highly capable of working with her back to the goal, with Lebanon’s Brianna Ragains as the one other example I can think of. She created the second goal when she deftly received the ball and turned her defender as she broke into the box on the left side. The Yellowjackets responded to the initial challenge and forced her wide but Frewin, Sprouse and Cline don’t allow defenses to rest. In this case, it was her second effort that allowed her to get a cross off that Sprouse simply redirected into the net before the keeper or defender could react. It was not a safe lead. The Yellowjackets have spent the season reaching for the level the felt they deserved and the Falcons knew it. From the resulting restart, and over the final ten minutes, Lebanon created as many opportunities as they had in the previous 70. Senior Rachel Duckworth and the defense responded, first as Duckworth had to range to her right to push a ball wide and minutes later, diving to keep a ball out. Lebanon was not able to get numbers into the box consistently this evening however. Senior goalkeeper Abby Roam played a key role in giving them the opportunity to potentially upset their higher ranked opponent, twice denying Lorin Opfer on set pieces in the box, including a fine reaction save in stoppage time in the first half. The Yellowjackets finish x-y, reaching their second straight District 11 final. They won’t sneak up on anyone next year and have a midfield that can match any in the region with Glidden, Boyer and LeFors returning. It promises to keep getting better folks! The Yellowjackets found the same reservoir of energy tonight that took them to the District Final last year when they upset the Glendale Falcons. It was the Tigers that established the early bragging rights, scoring 20 seconds into the game from Lauren Kelly, a margin they took to the locker rooms at halftime. In the words of Coach Gow, who leaves Lebanon for the Tigers job when this season ends, there was no need to raise his voice or even discuss what needed to be done. Each of the ladies knew what was needed and what they as a team were capable of having been here before. Junior Cassie Wood tied the game in the 48th on assists from Ashley Shockley and Chelsea LaFors but Erica Combs regained the lead for Waynesville in the 53rd. In the 60th minute, Callie Beard scored her first ever Varsity goal when she banged a ball from the midfield line that in combination with the wind somehow found it’s way under the crossbar, giving Lebanon their second tie. Wood got the ultimate game-winner in the 67th on an assist from Brianna Ragains. Both of her goals were scored on headers this evening. Katie Pritchard had an opportunity to tie the game in the final minutes but was unable to connect, ending the remarkable run the Waynesville Tigers made this year. 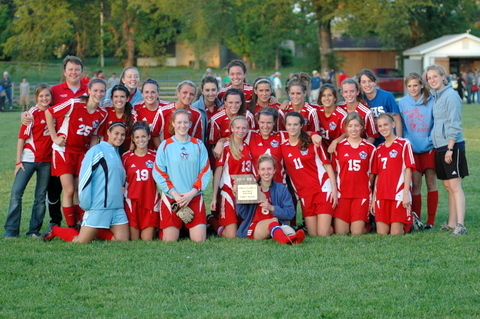 Undefeated in the Ozark Conference , a second straight Conference title but it will remain for a future team to earn the first Girls District Soccer title. The Falcon’s rebounded from last year’s disappointment to defeat the defending District Champions this evening on a late goal by Emily Cline. Glendale scored first when Jenni Frewin continued her recent scoring streak, assist to Cline. Rolla’s Jaclyn Standfast tied the game in the first half, unassisted, and thats where the score remained at halftime. The second half was a two-way battle as both teams attacked relentlessly until Cline broke through in the final 10 minutes, assisted by Emilee Williams. Rolla had a breakaway in the final minute of the game that grazed the upright. Senior Rachel Duckworth apparently got just enough of the ball to deflect it and protect the Falcon’s lead. The District title game will be Thursday at 6:00 pm at Lebanon. The Yellowjackets return to the final for the second straight year, this time they’ll face the Glendale Falcons. The Tigers got a goal in the first half to open a lead they would not relinquish. The Vikings finish their season at 11-10 and look to return as many as 8 starters next year. Kickapoo opened the scoring via a corner kick in the 8th minute. The ball made it across the entire mouth of the goal before it was tapped in by Erica Freiert on the far side. A shot by Chelsea Russell went off the hands of the goalie before falling to x for an easy tap in and Freiert got a second in the 25th after a cross to the far post. The second half opened with Nixa giving up an own goal off a corner kick as well. The Eagle’s got one back when their new #2 on the career scoring list, senior Stephanie Allen, scored on a PK. It came after Kelsey Bartell was fouled on a courageous challenge with the keeper. Keeper was called for the red card in the 55th. The final goal was scored by Chelsea Russell scored on a breakaway off a 70 yard punt by the Kickapoo keeper in the 64th minute. Coach Tom Davidson will take his Ozark Tigers to Joplin on Thursday to face off against the Kickapoo Chiefs for the District 12 title. Game time is 6:00 pm. Catholic got goals from seven players in earning the win. The winning goal was scored in the 25th minute of overtime, giving the Liberators wins over the Zizzer’s. The result matches the boys result a little over six months ago when the Liberators upset the top-ranked beat the Zizzer’s in the same way. The ladies almost got some payback tonight. Championship game between Bolivar and Catholic is 6:00 pm Wednesday at Willard. Katie Pitts’ two goals led Helias. Brandy Jungmeyer and Arielle Chambers also scored. Blaire Baker scored for the Lakers. Camdenton finishes the season with a record of 16-8. Lauren Kelly scored on a free kick in the fifth minute for the Bruins. The Kewpies finished the season with a record of 2-17-3. Lebanon got goals from Brianna Ragains (2), Emily Boyer (2), Janel Glidden (2), Hanna Winkel, Chelsea LeFors, Ashley Shockly and Brayli Hall. The Bulldogs finish the season 8-14. Parkview got goals from Shelby Stewart and Jessica Maerz in the first half, both assisted by Emmy Dale. Neosho got within one in the second before Stewart finished the scoring. The game between Nixa and Joplin was tied 1-1 after regulation and 2 15 min overtimes before going to PK’s. Nixa shot first, made their first three and Joplin missed their first three, giving Nixa the win 3-0. Update – Nixa scored in the first half on a Joplin own goal when Joplin’s defense was running towards their own goal and tried to clear. Nixa’s PKs were scored by Stephanie Allen, Jacklyn Finley, and Annie Pierce. Joplin opened the scoring in this match in the 15th minute, scoring via PK following a foul in the box. The visitors lead disappeared when Lebanon evened the score with a header by Ashley Shockley on a corner from Hanna Winkel. The Yellowjackets scored again shortly before half with a header by Chelsea LeFors off of a nice cross from the corner from Cassie Wood. The Jackets finished the scoring with a cross by Hanna Winkel knocked in by Michelle Lindesmith. Joplin goalie Randi Russell once again kept things close. The Chiefs got their fourth straight win, shutting out the visiting Lady Lakers while moving to 9-8 on the season. A direct kick by Katy McLain from almost 30 yards out slipped under the crossbar to give the Chiefs the lead in the 18th minute. As has been the case in the three games I’ve seen the past two weeks, the Chiefs calmly went about their business, challenging every ball and slowly wearing down their opponents. With junior Amanda Dominguez (pictured on left) the one constant in the central midfield this season, the Chiefs have been able to move the ball and create their own luck, a welcome change for their supporters following the slow start to this season. The Tigers got goals in the 21st and 51st minute to earn the win. Bolivar put one of the crossbar and Paige Hemphill stopped another late opportunity to preserve the shutout. 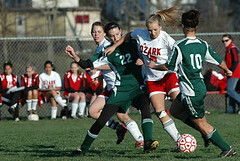 Ozark goals were scored by Megan Stodden from Megan Jenisch and Brittany Matthews from Megan Gunnels. Both goals in the first half, with both teams failing to convert a PK in the second half. In a surprisingly tight game, Catholic finally scored in the second half, goal by Anna DeLong from Natalie Smid. Nixa senior Stephanie Allen tied the game, from Jo Pavlowski’s assist, to force overtime. DeLong got the game-winner in the first OT period, from freshman Carsen Baron. Senior Kristen Glaubitz buries a ball in the corner from a set piece midway through the second half to give the Tigers the rare win over their longtime rivals. Coach Tom Davidson earns his 500th win as his Lady Tigers held off the Irish in earning the win. The goal came against the run of play as the Irish had the wind and momentum but sophomore Brittany Matthew’s strong run led to a foul on the left side of the box. Rachel Haden’s service was initially knocked down but fell to Glaubitz who took advantage of the opportunity. The Irish’s best opportunity came late in the game when freshman Carsen Baron put her 30 yard direct kick on frame. Sophomore Paige Hemphill touched it over the crossbar to preserve the shutout and win. The Tigers continued their early season form, taking a 2-0 lead in the first half on goals by Katie Pritchard, from Lauren Kelly, and Erica Combs, from Tasha Lord. Kickapoo closed the gap in the 73rd minute when Kylie Huslig scored from a cross by right midfielder ?. Senior Crystal Hutchinson made several important saves to ensure the win for the Tigers who move to 4-0 with their first Conference win over a key foe. Update – it was the first win ever over the Chiefs! Sophomore central midfielder Jackie Standfast got the game winner in the 62nd minute on an assist by senior captain Kaitlin Bramel. Sophomore Adrian Pogue gets the shutout, her 3rd in 4 games. The Bulldogs move to 4-0, 1-0 in Ozark Conference, and will visit Springfield to take on Kickapoo Thursday. The Eagles kept things close in the first half, down only 0-1 with senior Randi Russell, a Missouri Southern signee, making several important saves. Senior Jeni Frewin got the ultimate game winner. The second half saw the Falcons turn things on, using the wind and their team speed to get three goals in the first 15 minutes. Lindsey Sprouse got two, Emily Cline (pictured at left) scored her first varsity goal and Frewin and Emily Jordan earned assists. Senior goalkeeper Rachel Duckworth, a newcomer to soccer with good hands and reflexes, earns her first shutout. The Eagles lost on PK’s Tuesday to a resilient Wildcats squad that drew first blood on a break away goal by Melanie White in the 53rd minute. The Eagles tied the game in the 58th. Jacklyn Finley played the ball to Kelsey Haist above the 18 box. Haist beat the defender. A well placed, low ball slotted to the left of the goalie tied the score 1-1.